Otodo Gbame evictees forced to seek watery refuge on Lagos Lagoon. The Otodo Gbame waterfront community in Lagos first made headlines when it was marked for demolition to make way for Nigeria’s commercial capital’s ‘megacity’ ambitions. 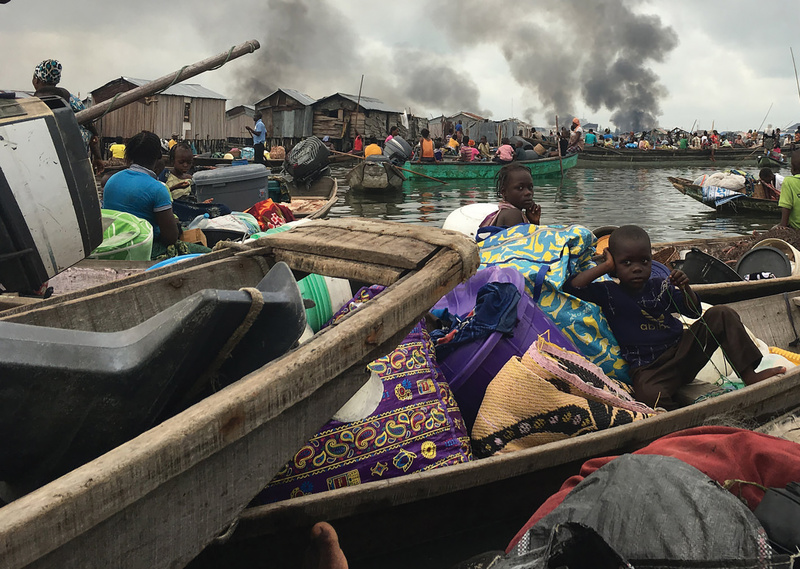 Last November, security officials stormed the slum settlement on the Lagos lagoon, removing some 30,000 residents who are now forced to sleep in boats and on open fields. Rights groups are warning that more than 300,000 residents of some 40 waterside slums in Lagos are at risk of being pushed out to make way for development projects. The city is growing at an exponential rate. Lagos has a population of 21 million, which is set to double by 2050. Already Africa’s largest city, its numbers swell by over 500,000 each year as people migrate in search of jobs. The new arrivals face a shortage of affordable homes and thus the number of informal settlements grows. The Lagos High Court ruled that the initial evictions were ‘inhuman and degrading’, and asked the Lagos state – which is keen for its capital to become ‘Africa’s model megacity,’ at any cost – to seek solutions for residents. But the government took a different path. On 17 March, a law-enforcement task force demolished more homes, bulldozing the shacks of more than 4,700 Otodo Gbame residents, in defiance of the court order. Thousands of residents said security forces used gunfire and teargas during the eviction. In late June, the Lagos High Court ruled once again that the forced eviction was unconstitutional and ordered the government to pay compensation and provide alternative accommodation. The state is attempting to solve the long-term housing crisis with projects such as Eko Atlantic City – a housing project being built on reclaimed land on the shores of affluent Victoria Island, in south Lagos – which is expected to house at least 500,000 (predominantly middle-income) residents.